Covering the load for Warmerdam Paeonia! Love for the genus Paeonia and Passion in all our peony activities is what it's all about for us. Our family has been peony-crazy for a long, long time; Warmerdam Paeonia stands for over a hundred years of experience in peony growing. Currently, already the 4th successive generation of the Warmerdam-family is passionately growing peonies. We try to spread our "peonism" as much as we can! Our Warmerdam-family has been having green blood running through their veins for a very long time. 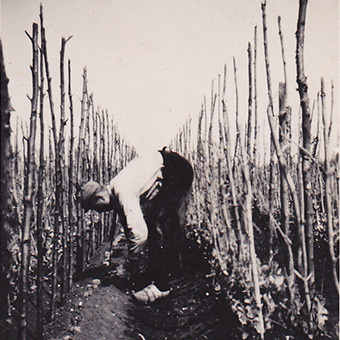 At the end of the 19th century no crop specialization was present yet. In those days mixed cultures were common practice in our home area. Vegetables were the main crops, and some peonies ('Duchesse de Nemours', 'Rubra Plena') were grown already as well. My late grandfather expanded the peony assortment with particularly 'Sarah Bernhardt'. Next to peonies, he mainly grew broad beans (see picture on the top left), strawberries, fresias and carnations. Only one of my grandparents' five children was truly enthusiastic about peonies. Luckily for me, this happened to be my father! My dad, Wout Warmerdam, switched to simply and solely floriculture. 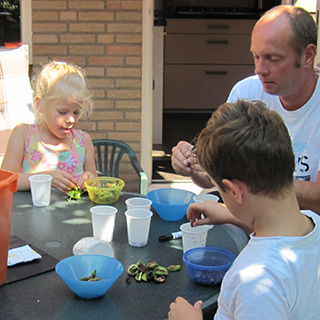 With this the vegetable growing days were over, as it was for many nurseries in and around Roelofarendsveen (our town of origin) in those days. Fresia, Ornithogalum and especially Paeonia became our main crops. 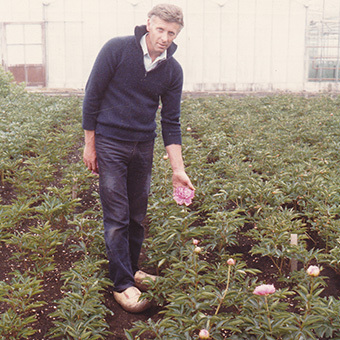 In the 80's and 90's of the last century my father added a dozen varieties, bringing the total number of different kinds of peonies that he grew to around 15. Among these were the still very popular varieties 'Red Charm', 'Shining Light' and 'P?cher'. Since the year 2000, I (Ruud) entered the peony adventure with complete devotion. We are very proud to call ourselves 100% specialized in peonies for such a long time now, all side crops have definitely moved to the history books now. We continuously add very many new varieties to our peony collection, resulting in 794 varieties that we currently grow with great pleasure and devotion. From this huge collection, we will be offering exactly 200 kinds of peonies in 2019! We review the varieties in our stock every year, and the number of different peonies proves to be ever growing. We aim for growing an assortment of distinctive peonies which have great garden- and/or cut flower qualities. Next to supplying wholesale customers such as colleague growers, export companies, webshops, garden centers and landscapers, we also ship peonies to retail customers all over the world. Last year, in 2018, we have added the only group of peonies that we never had offered before: Tree Peonies! After years of testing, we are now confident to sell these magical woodies - and all on their own root system for quickest and best results for our customers! The number of plants we grow of a certain cultivar is highly variable, anywhere from 10 to 10,000+. Because of this, we grow a different assortment for wholesale customers compared to our retail assortment. Next to this plant production, we also grow 15 varieties of peonies for the cut flower industry on about 1.3 hectares of land (3 acres). In total we grow peonies on about 3 hectares (about 7 acres). Nowadays this means we are a small-sized company, certainly in The Netherlands. We intend to keep it this way, to secure our high quality standard. For us, it is without a doubt that we will keep on growing peonies alone. Living your hobby and passion as a profession - we just cannot imagine it can get any better than this! In November 2008, with Luke the next generation Warmerdam has been born. 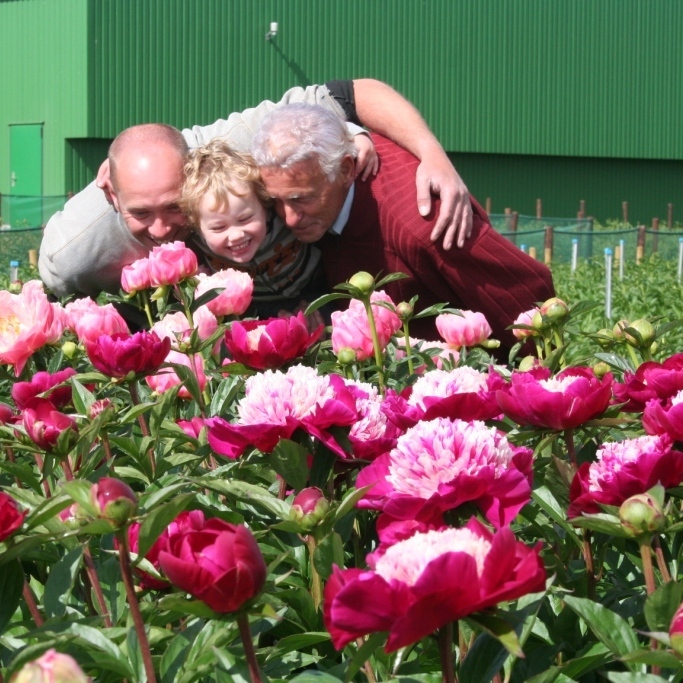 At the end of flowering season 2011, Luke was joined by his beautiful little sister Nikita (a genuine peony-baby!). Who knows they too will get seduced by the beauty of peonies, and will continue the peony tradition in our family a fitfth generation... Only time will tell. 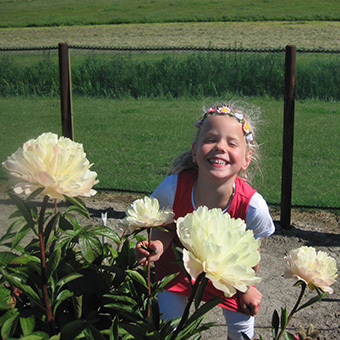 In any case, during this time we will enjoy our children and our peonies to the fullest!